• Great for heavy weight fabrics such as denim and wool. 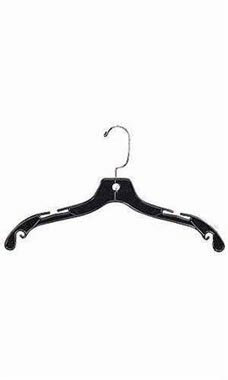 The Heavy Weight 17 inch Black Plastic Dress Hangers are great for heavy clothing such as sweaters and more. These heavy weight hangers have the same great design, shape, and dimensions of our light and medium weight hangers! Featuring anchored chrome swivel hooks and notched shoulders for hanging straps, these black plastic hangers are a great addition to your retail displays. The Heavy Weight 17 inch Dress Hanger will hold up to 18lbs which makes them perfect for clothing that needs a stronger hanger. Sold in cases of 100.